I give Debbie Travis so much respect for taking the risks she did and building the career she has from scratch. I had seen Debbie Travis on TV when I was younger. It was definitely something my mom had on when I’d leave or come back from school, I can’t remember, but that’s the feeling I got when I realized this book was written by the Debbie Travis. I’m all about self-help books right now. I keep coming back to them and honestly there’s nothing wrong with trying to improve on yourself and becoming a better and/or happier person. 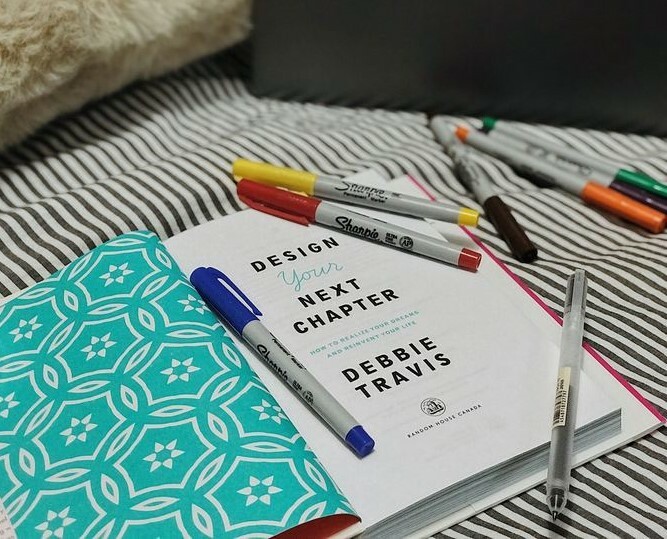 I found Design Your Next Chapter to a very beautiful and practical book to help people overcome their own fears and excuses to following their dreams. Helping people see what the next steps could be depending on the fear or excuse they find themselves having. But this book if definitely targeted to an older crowed. This book focuses on after succeeding or hitting a stand still place in your career and helps design your next chapter including important subjects on how to follow your next chapter with a family and financial stresses. There are case study throughout the entire book with other people’s stories of following their dreams, which include their fears, struggles, and successes. I don’t understand why all case study’s are always placed in the most random places in books. It’s never at the end of a paragraph, section or chapter. They’re always placed in the middle of a sentence or paragraph. It’s so weird. This book includes places to write your own thoughts at the end, which is great for people who enjoy writing in their books and for those that will go back to this book to reflect. Right now, I am not the type of person who wants to write in their book because it’s so personal and I never have enough space for everything I want to write (so I think). Even though I feel this book is targeted to an older audience I enjoyed getting to know Debbie Travis on a more personal level and learning about her journey and how she was able to follow her dreams. She’s an ambitious women that doesn’t seem to let her fears or the risk of something new get in the way of her next adventure and I love that. I find it fascinating to read about other people’s journey of life and following their dream (what every those dreams are).